CHAMPAIGN, Ill. — Scientists once thought that female mate choice alone accounted for the eye-catching color patterns seen in some male fish. But for orangethroat darters, male-to-male competition is the real force behind the flash, a new study finds. 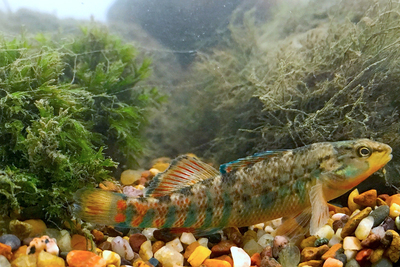 The research, reported in the Royal Society journal Proceedings B, suggests that separate populations of orangethroat darters are evolving differing color patterns as a result of the males’ ability to distinguish their own from other species. 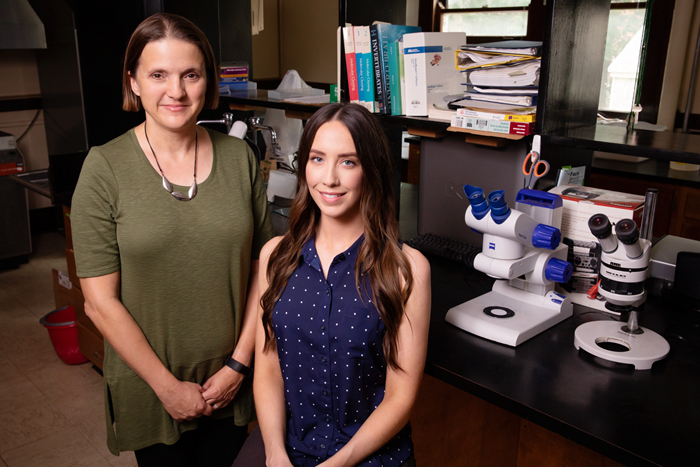 Illinois animal biology professor Becky Fuller, left, and graduate student Rachel Moran study the factors that drive fish evolution in freshwater systems. “The females don’t choose their mates,” Moran said. When fertile, they simply burrow into the gravel and wait for a mate to arrive. “Males of the same species will come up and try to mate with a female and fight off other males,” she said. “To be successful, they need to distinguish between their own and other darter species,” she said. Only orangethroats that coexist with rainbow darters have developed this ability, recent studies have found. Once they learn to avoid rainbow darters – a more distantly related species of fish – orangethroat males won’t mate or fight with even closely related orangethroat species. “This shows that this is something that is genetically based and that those differences are not due just to the environment,” she said. When they share habitat with rainbow darters, male orangethroat darters learn to recognize their own and other species. They ignore other fish that look even slightly different from themselves, a behavior that appears to drive the evolution of their own color patterns. “Natural selection has favored fish that are able to distinguish between their own and the other species,” she said. 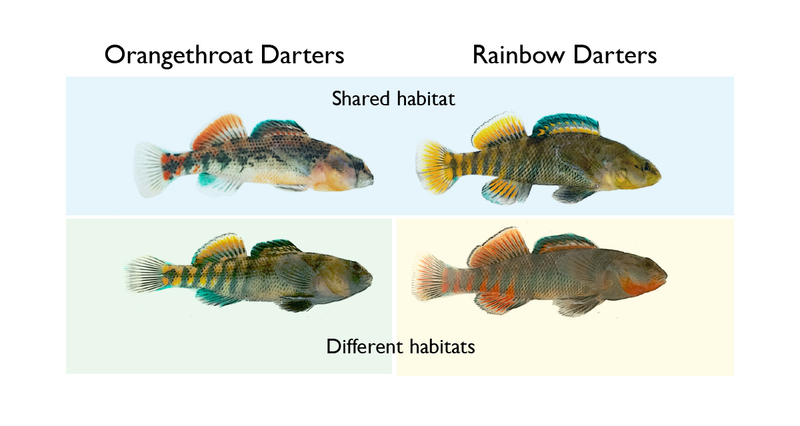 The paper “Agonistic character displacement of genetically based male color patterns across darters” is available online and from the U. of I. News Bureau.